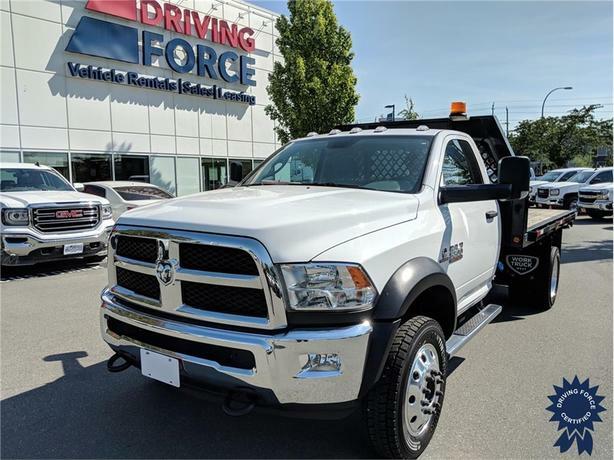 This 2017 Ram 5500 Regular Cab 3 Passenger 2WD 12-Foot Flat Deck Truck has a 168-inch wheelbase, 84-inch cab-to-axle, 4.88 rear axle ratio, 19.5-inch wheels, Max Tow Package, power take-off prep, engine shutdown timer, trailer brake control, full-size spare tire, chrome tubular side steps, fog lamps, upfitter electronic module, Uconnect 3.0 AM/FM/Hands-Free system, rear wheel drive, engine block heater, HD shock absorbers, front anti roll bar and rear HD anti-roll bar, 196-litre fuel tank, and GVWR rating of 19,500 lbs (8,845 kgs). The 6.7-litre I-6 Turbodiesel engine provides 325 horsepower at 2,900 RPM and 750 lb-ft of torque at 1,600 RPM. Touch base with us to discuss purchasing or financing options that are right for you and experience the difference you will only find at DRIVING FORCE Vehicle Rentals, Sales and Leasing.